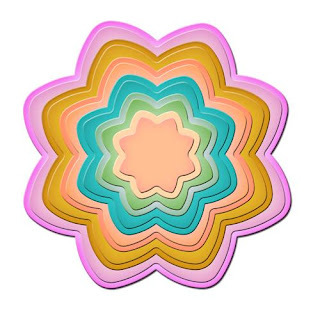 This set of Nestabilities die templates is the perfect concentric flower with 8 petals. The projects that will bloom out of this set are innumerable. Imagine layering the flowers to create a bouquet for a home décor project or a pin for Mother’s Day. Use the die cuts to frame photos or hold a stamped image. Beautiful! Approximate Die Template Sizes: 1) ⅝" 2) 1¼" 3) 1⅞" 4) 2½" 5) 3¼" 6) 3⅞"